I think an errant comment led me to this week's featured blogger. Who knows? What I do know is that, once I saw the page load, I knew I was in the presence of a kindred spirit. It's rather easy to see by taking a look at my blog that I'm a visual person. Book covers, graphics, my own photos-- there are clues everywhere. But for one reason or another, I keep my blog toned down a bit. 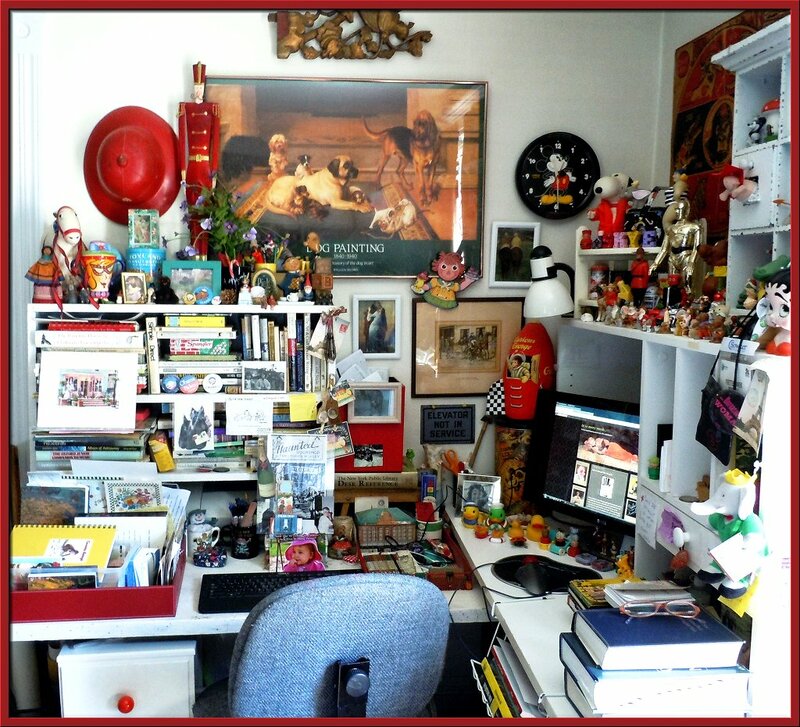 I’ve always gotten such a kick out of viewing other blogger’s personal spaces and now it’s my turn. 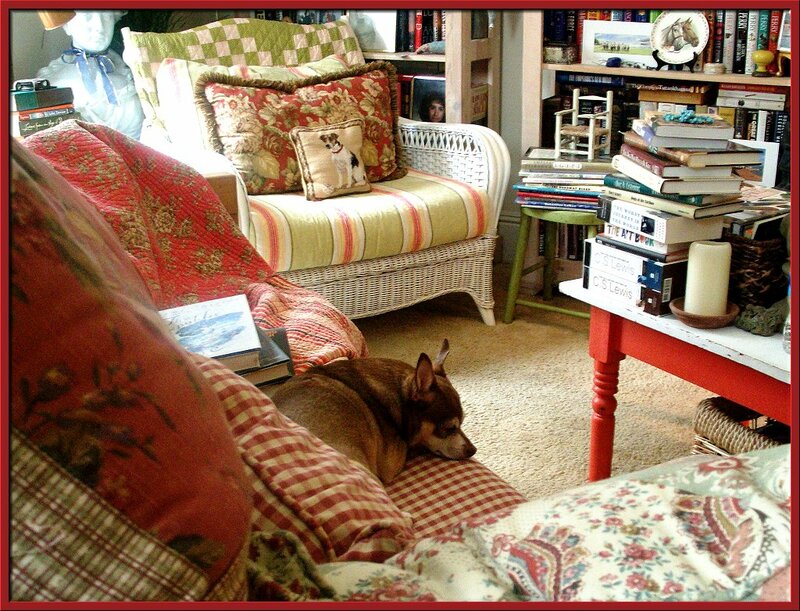 Rocky making sure the reading area is comfy. When I first moved here a few years ago I turned the living room into a studio by dividing it into three workable areas: computer work station, drawing table/painting corner and sofa/book space. As you can see, I’m not one for blank spaces or empty walls. I like to think I am like Mother Nature, I abhor an empty space. I also like to think that my work area reflects me and only me. I doubt there’s anyone else who could live here surrounded by all this stuff and be comfy as I am. It is, I think, a very personal space. In my view, all our living places should be uniquely personal. Whether I am sitting at my computer, painting at my drawing table or reading on the sofa or chair, I am always surrounded by stuff. 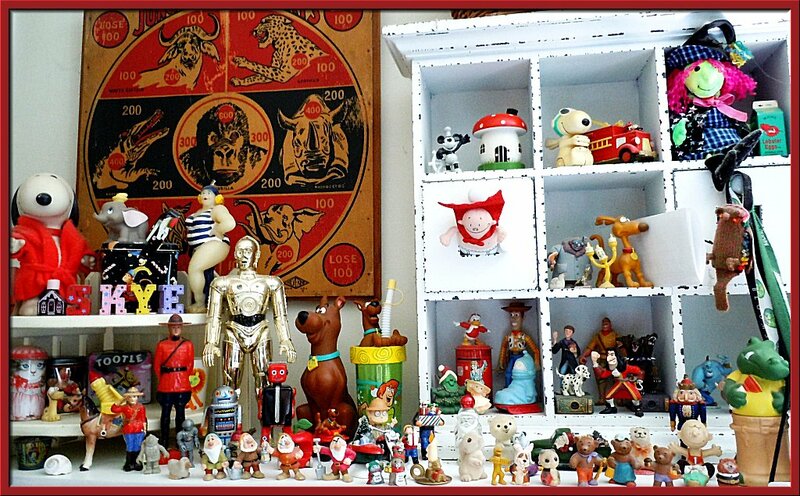 Each and every item in my ‘collection’ has meaning for me - almost all have a story to tell. They’re talismanic, in a way, reminders of some happy memory or other. My lifestyle is fairly casual, but I like to do each task in a self-appointed space. I only ever draw or paint at my work table simply because I like things on a slant AND my old fashioned CD player is right behind me on a shelf so I can listen to music or books as I please. Yes, I’m still old fashioned enough that I don’t get all my audio books or music from my computer. I’ve just never gotten into the habit and I’m probably too old now to change. I always write at my desk-top computer – don’t have a lap top - OR, occasionally in long-hand. 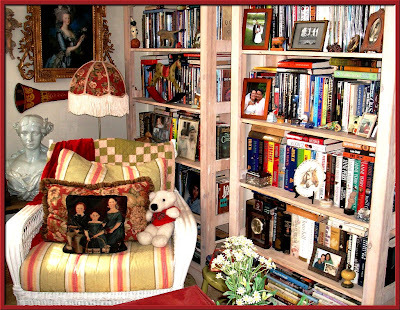 Since I don’t enjoy reading large tracts of type from a screen, I read real books either in the kitchen or in bed or on the sofa or living room chair which is large enough to accommodate both me, my dog and several books, pillows and, in the winter, a warm throw. A book is never far from reach. I’m lucky enough to have a large kitchen with a big wooden table where I can also read or work on bills or whatever. 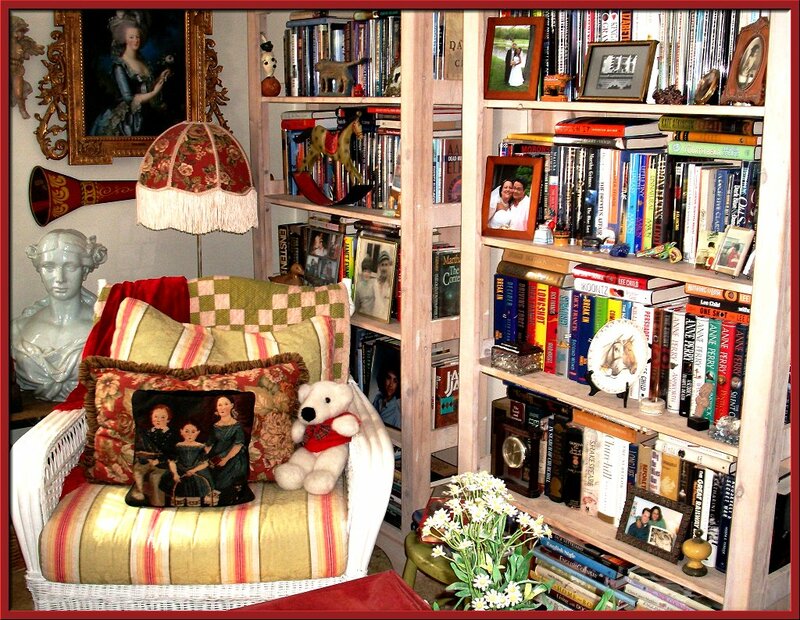 I have bookcases there too as well as in my bedroom. A book is never far from reach around here. This is my own cozy corner of the world and welcome to it. Thanks Cathy for allowing me to share my space on SCENE OF THE BLOG. You are so very welcome, Yvette! 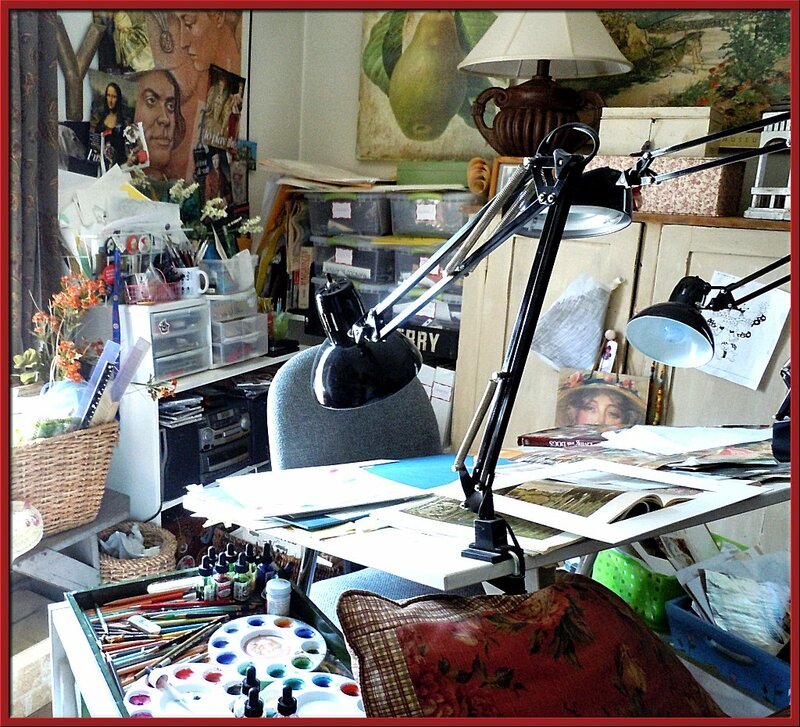 I don't know about anyone else, but I certainly enjoyed this glimpse into your creative spaces. There's something about such an intense, personal space that I respond to whole-heartedly. I feel as though I could take my shoes off, get comfy, scratch Rocky's ears, take a look at all your collections-- and still have time for a cup of tea and a good long chat with you. It is a very welcoming space as well as being very creative. Thank you for allowing us this visit! Stop by next Wednesday when I'll be featuring another book blogger from our worldwide community! Wow, the area looks so busy to me who likes empty desks, but it also looks fantastic. I'm a tad jealous ;) the reading area is also beautiful. Oh wow this is exactly how I'd love my house to be! I hate empty walls and have far to many of them currently! Yvette, and her blog, are one in a million. Oh, these gorgeous pictures are just so much Yvette! 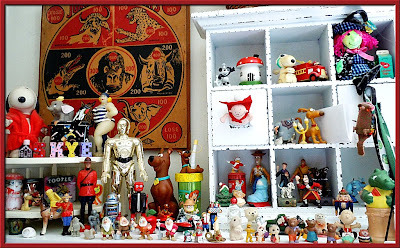 I visit her blog all the time, and sometimes I forget all about READING her posts because there is so much to look at. This was a wonderful treat! I have been enjoying and learning from Yvette's blog for awhile now and I knew she had to have a really interesting and comfortable home that would reflect all her varied interests! These photos confirmed my suspicions! I love your work and leisure spaces, Yvette! I adore Yvette and her blog and I'm always happy to pop over there and spend a while reading whatever it is she posted. It was nice to be able to see where the magic happens. WOW! Yvette, your spaces are fantastic. Comfy and colourful. A place I'd love to visit. Thanks for the kind comments, guys. The blogging community is such a terrific place. We're a fine bunch, don't you think? Hanna-- I know that it immediately became a favorite of mine. 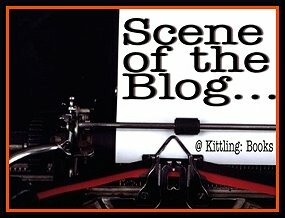 Thanks for stopping by Scene of the Blog!